For the 4th year in a row TCE has earned an award for Vermont Worksite Wellness. 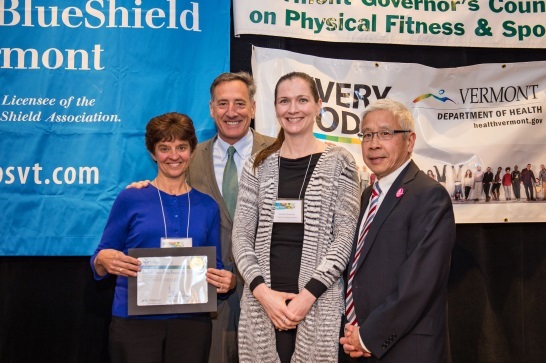 This year’s award, Excellence in Worksite Wellness was presented to TCE wellness committee members Jennifer Desautels and Lori Hennessey by Governor Shumlin and VT Dept. of Health Commissioner, Harry Chen at the March Worksite Wellness Conference. In receiving the award, TCE was one of 67 Vermont employers who were honored for innovative practices to improve the lives of Vermont citizens, creating a standard of excellence for wellness programs in VT. TCE is proud to be a recipient again this year and strives to include and promote wellness both in the office and beyond! Wellness has taken root in TCE’s culture! Now in its 5th year TCE’s Well@Work employee wellness plan has strengthened and grown through the years. It has evolved and encompasses much more than the basic physical aspects and nutritional content it started with. Recent additions to the plan include an Innovative Thinking Award which rewards employees for developing an idea that benefits TCE’s work flow or product. Lunch and learns have grown in popularity and include a wide variety of industry and product related topics. TCE’s company garden is well established also, currently operating in its 3rd year. The company also supports and encourages volunteer efforts. For several years we have engaged in a fall cleanup effort at Jim’s House in Williston. This month TCE is looking forward to a tree planting party along the Allen Brook in Williston sponsored by Friends of the Winooski River. We’re doing our part in becoming “green”. Along with the trend to send items in pdf format, we recently began purchasing recycled copy paper for printing that must be done on paper. For a change of pace this year we are offering a different group activity every month. To promote team morale and a family atmosphere we’re inviting family members to join in. 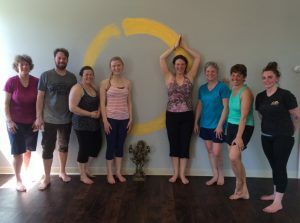 We’re half way through the year and so far we have taken a group spin class, gone bowling, enjoyed simulated golf at Gonzo’s, tried Bikram yoga, ran in the Corporate Cup 5k race, and most recently spent a few hours kayaking on the Lamoille river in Jeffersonville. While August, September and months to follow are not yet planned with a specific activity there are so many fun and engaging outside activities to choose from….it’s really a good problem to have!